Combat medics are one of the most crucial elements of every infantry unit in the game. Without them any attack or point hold wouldn’t last for long. Aside from their great support abilities, combat medics also have a lot of potential in direct combat, and due to their equipment can be very versatile soldiers. If you are a new player, it’s strongly advised for you to first read the beginner guides and weapons and their mechanics guides, which contain a lot of crucial information about gameplay and important game mechanics. If you think you have a suggestion on how to make this guide better, or a new idea, or just a curious fact, feel free to contact the administrator or me, or just leave a comment below, we welcome any and all feedback. There are many reasons to play as combat medic. First, it’s a very effective support class. Second, a very good combat class. Third, it’s tools, abilities and access to the best automatic rifles in the game make it probably the best choice for a cert farming loadout. And what’s best, you earn those certs by helping your team! So let’s take a more detailed look. They can heal wounded teammates. They can revive fallen allies. With revive grenades they can do it in mass and from a distance. At the same time they can effectively defend themselves (thanks to access to assault rifles and self-heal) and kill enemy players. All of these points make combat medics very versatile soldiers, especially if you account for access to C4 and wide arsenal choice. Versatility – concentrated attack, point hold, skirmish in open field, loose firefight in urban area – combat medics are well suited for any situation. And in case they find a way to get close to enemy MAXes or vehicles they can destroy them with C4 bricks. Combat medics aren’t as strong in direct combat as Heavy assaults, aren’t as mobile as Light assaults and Infiltrators and don’t hold as much destructive power as Engineers, but in right hands they are superior in drawn fights where a player can have at least some freedom of movement. Basically everything you do as a combat medic gives you a fair amount of XP. Since the class is well suited for killing enemies – you can get a lot of certs simply by killing your foes. Add to this points for healing and reviving and your XP income significantly surpasses what you could get as Infiltrator or Heavy assault for example. Actually, in heated fights your cert earnings only from healing and reviving can be really huge, especially that there are usually little other medics on the field. On top of that, healing and reviving only requires starting cert investment and a basic level of situational awareness, which makes the class very good for new players who want to get some certs quickly. Primary weapon, it’s damage per second and effective range. Ability: self-heal or shield recharging. All other choices obviously matter as well, but those three are the most defining. There are many viable combinations, I’m only going to point out one essential thing. As a medic it’s very, very important that you can heal yourself. Lives of your teammates depend on you after all. If you equip Nano-Regen Device, then fine, you are free to use whichever utility item and implants you want. However, if you take Shield Recharging Field, you have to provide yourself some kind of self-healing. You have two choices – med-kits and Regeneration implant. First have limited uses and cost Nanites to refill, the second takes quite a time to heal you – there’s a 10 seconds delay after you stop taking health damage before it starts working, then it takes 25 seconds to heal you from 0 (theoretically of course) to full if you use tier one implant, and 15 seconds if you use tier 4-5 implant (which is expensive to upgrade). You have to decide if having C4 is really that important for you, equipping Regeneration is a good idea regardless if you use med-kits, but it’s not a bad thing to take another implant instead, like Battle Hardened. Below you can find cookie-cutter loadouts for both roles of Combat medics. I designed them to give the best versatility depending if you want to focus on killing (combat focused loadout is actually versatile enough that you can effectively support your team with it) or entirely focus on support (this loadout IS viable for combat, but more defense focused). The overall idea behind this loadout is to provide you with maximum versatility, so you can be a “one man army inside a bigger army”. What to buy to further upgrade the class? You have the basic, fully functional loadout, now it’s time to max it out and specialize. Your default assault rifle is an excellent and versatile weapon, but can feel a bit bland after a time. You may wish to pick up another weapon if you want something more interesting or specialized. For more information about assault rifles go here. Unlock Revive Grenades. They are amazing. Not only they are a great tactical asset, they also increase your XP income if you use them often! Put more upgrades in your desired suit upgrade. Max out Med or Resto Kits or C4 for better combat efficiency. If you want to use Shield Recharging Field, halt all your spendings on other items. Low rank Shield Recharging Fields are blocked by higher ranked if they are close together. Scroll down to Class Abilities to learn more. Assault rifles – very good weapons ranging from close quarters oriented guns with high damage per second to highly accurate long range rifles. Battle rifles – semi-automatic weapons suited for medium-long range combat. Sub-Machine Guns (SMGs) – strong CQC weapons focused on mobility. Shotguns – suited either for short range (with buckshot ammunition) or short-medium (slug ammunition). It’s entirely up to you to decide what you are playing with, as long as you remember about limitations and strengths of each weapon and are able to play accordingly to them. For example it doesn’t make any sense to take an SMG to a long range fight, but Battle rifles are viable at short range if you are very good with them. The default assault rifles are very good all-around weapons and will serve you well in all combat situations. My advice is to stick to them for some time, until you figure out the game and upgrade your class more. A point to consider is how are you going to play. Are you going to sit behind a line of allies and provide support to them, while being mostly safe? Or are you going to move between buildings with your squad? Or maybe you are just going to focus entirely on killing enemies? There’s never the best weapon, but there are weapons more suited for certain situations. You can of course just choose one favorite weapon and stick to it if you want to, there are plenty of assault rifles which are great all-rounders. Combat medics use the same sidearms as everyone else. For detailed reviews check the Sidearm Guide. As a medic you should rarely be in situation where you run out of ammo and have to switch to secondary to finish off your target. However, it’s quite common to be surprised by enemy while holding the medical applicator. In first case you’d want a strong finisher – something either with high damage per bullet or high DPS (damage per second). In second case – something which can effectively fight primary weapons at short range. If you have a good aim, Commisioner and Underboss fulfill both needs, just be wary that those pistols punish missed shots heavily. If you are not confident in your accuracy, or want to have higher margin for error, any other pistol would do. However, there are two exceptions – crossbow and Blackhand. First is very unwieldy and even more punishing than Commisioner, while the latter has 4x scope (you can’t equip any other on this gun), only four bullets in the magazine and 3-4 second reload – despite it’s great damage output it’s simply ill-suited for close quarters. Default sidearms are definitely good enough, they are actually one of the best pistols in the game. Medical applicator is the main tool of combat medics used to heal and revive ally soldiers. It’s also the main source of class’ XP income after killing enemy players. Heal and Revive range is equal to 6m at all ranks, and infantry players are always revived at full health (but not shields). Upgrading the Med Tool increases healing and reviving speed, as well as health of revived MAX units. Healing speed is equal to 100/110/120/130/140/150 health per second (source). It is very important to upgrade the medical applicator as soon as possible at least to fifth rank, which gives a decent improvement for only 190 certs in total. But once you have saved 500 certs more, upgrade it to the sixth rank, as reviving faster is incredibly helpful in dire situations. Furthermore – you earn XP faster with an upgraded device. It’s easy and comfortable in use – pointing at an ally in range and holding left mouse button heals him, pointing at a dead ally and holding right mouse button revives him. The Nanite beam produced by the medical applicator snaps to targets, which allows freedom of movement for medics. Dead players can be revived in 30 seconds, and always have 10 seconds to accept or reject the revive, which leaves medics with plenty of time to help. Known issue: when reviving a player, the progress circle around the crosshair can lie. To be sure you have successfully revived the player, pay attention to his corpse. As soon as it moves, you know you have successfully revived, and you can stop holding the beam. However there are some safety rules you should follow to be a successful medic. Do not pull out your medical applicator unless your are sure that you are not in immediate danger. Do not try to revive allies who died in position guarded by enemies. They have no chance to get up anyway, and you are putting yourself at risk this way. If an ally died behind a corner or out of cover and you think that he has a chance to get back into safety – step out to have him in reach, acquire the lock and jump back into cover immediately. This way you are minimizing risk of getting killed yourself. Stay mobile while reviving and healing, you do not want to get shot because of being an easy target. Sometimes you will have to prioritize revives. If your position is being compromised – start with medics, then go to players with ending death timer. If your position is being overrun – start with heavy assaults, then medics. But don’t go too far in proritizng revives – there is no point in running 30 meters to save a random HA when you have dead allies around you. Nano-Regen Device upon activation (F key by default) heals the user and allies within 1m radius for 75 health per second. The healing can last up to 8 seconds and the device’s energy regenerates from zero to full in 42 seconds (34 at max rank). Upgrading NRD increases recharge rate by 8/11/14/17/20%. Max rank also increases healing range by 1m. Nano-Regen Capacitor suit slot equipped increases recharge speed by 20%. Since the device can regenerate indefinitely, it’s the most reliable way of self-healing in the game. It’s worth noting that the healing doesn’t stop upon taking damage, so in majority of cases you can take one bullet more before death. It takes only 291 certs to upgrade Nano-Regen Device to the last rank, this paired with it’s great effectiveness makes it a nearly mandatory purchase. Healing from Nano-Regen Device doesn’t stack with Restoration Kits. Shield Recharging Field is a deployable device with infinite uses, which after placement creates a shield recharging sphere with a radius of 7 meters at maximum upgrade level. The exact rate of recharging is unknown, but it appears to be somewhere around 50 shield points per second. The recharging starts as soon as you either enter the field with damaged shields or take damage while already being in the field, meaning that it will allow you to tank one bullet more. Effects of Shield Recharging Fields do not stack, even if they are overlapping. If that’s the case, a player receives recharging from either the one at highest upgrade level, or the one he entered first, if they are at the same level. Triage is a passive ability (meaning that it’s active all the time and can’t be toggled on), which heals all allies inside and around a vehicle occupied by a medic. The range of area healing is 5 meters. Triage regenerates 10/15/20/25/30 health per second, depending on rank. It can also repair MAXes, so infantry is healed by up to 30 HP points per second and MAXes by 120 HP points per second. Triage doesn’t occupy ability slot (you can have both Triage and NRD/SRF equipped and active at the same time) and it’s upgrade screen can be accessed by clicking the orange Combat Medic Certifications button in inventory menu. Triage is very expensive for what it offers and as such, it’s not advised to upgrade until you literally have nothing else to spend certs on. Suit upgrades are important gameplay altering perks. They provide great bonuses, open up unique combinations with abilities and equipment, and synergize greatly with certain playstyles. For detailed suit upgrades analysis and comparison visit the Suit Slot guide. Nanoweave Armor: gives additional 20% small arms resistance on body hits, which can result in prolonging your time to kill for the enemy even by 30-50% if he doesn’t score any head shots. It’s an extremely viable defensive utility. With Nanoweave Armor you can easier fight enemy Heavy Assaults, get advantage over other infantry, and most importantly – have better chance of survival. And as we know, death of medics equals to death of everyone else. Nanoweave Armor also synergizes well with Nano-Regen Device and Shield Recharging Field, as you get in fact 25% more of them under fire if your enemy hits your torso/legs (which is the case in vast majority of encounters). Advanced Shield Capacitor: reduces the time it takes to regenerate personal shields from 6 to 3 seconds, and in result decreases total shield recharge time from 12 to 9 seconds. It’s mostly a convenience, ASC (short for Advanced Shield Capacitor) doesn’t give any advantage in direct combat unless you are engaged by enemy between 6 to 12 seconds after you stopped taking damage and retreat to cover with depleted shield. But it pairs extremely well with aggressive style of play, allowing you to come back into fight faster and increasing the overall pace of game. Equipping both ASC and Nano-Regen Device extremely shortens your recovery time. This is a quite addictive combination, I know it from myself 😛 But it’s essential to understand, that by choosing ASC over Nanoweave you have to counter your total effective health decrease with higher skill. That’s why I can’t recommend this upgrade to newer players. I personally moved from Nanoweave armor to ASC around Battle Rank 80, and until then, Nanoweave Armor helped me greatly. Flak Armor: halves the damage you take from explosive weaponry, like grenades, rockets, tank shells and AP mines. Flak Armor mitigates both splash damage and direct hits. It allows you to survive direct rocket hits and helps greatly against splash damage from grenades, C4 and High-Explosive tank shells. It’s extremely useful in heated point holds where your position is spammed with various explosives. Again, the most important rule of being a medic – dead medic = dead team. Grenade Bandoleer: allows you to carry up to 4 grenades simultaneously. It synergizes greatly with Revive Grenades, allowing you to either spam-revive masses of fallen allies, but also letting you use the ranged revive more frequently, which is very beneficial for organized squad play and for farming certs. Highly recommended, I’d even say that it’s almost mandatory to have it unlocked just in case. In case you choose Frag Grenades over revives – it’s a very effective, but expensive, offensive tool. But it comes at a price of losing durability and faster recovery. Viable, but not recommended in this case. Ammunition Belt: allows you to carry 4 more magazines for both primary and secondary weapon. Since as a support-oriented class you are most likely going to be near your allies, you are rarely going to run out of ammunition. The only use for this suit upgrade is enhancing solo play with long range assault rifles, but even then it’s easy to find ammo packs unless you camp in mountains. Not recommended for general use. Adrenaline Pump: increases sprint speed by 10%. Completely useless unless you focus on getting knife or shotgun kills. Not recommended.it upgrade is enhancing solo play with long range assault rifles, but even then it’s easy to find ammo packs unless you camp in mountains. Not recommended for general use. Nano-Regen Capacitor: increases the recharge rate of Nano-Regen Device by 20%. Unlocked and equipped by default. Combat medic has access to one standard offensive grenade and two support grenades, exclusive to the class. Standard grenades capable of dealing high explosion damage to enemy infantry and MAXes in short range. Costs 50 Nanites to resupply. Not advised unless you are running a purely combat focused build. Support grenades play a big role in medics’ equipment. When thrown, creates a healing field that restores 100 health per second to allies in a 10m radius. Healing from multiple healing grenades doesn’t stack. Cost 25 Nanites to resupply. Very situational and rarely used. It would be a waste of Nanites to use them to simply heal wounded team mates, and their only actual use would be to throw several in one place and grant allies in range very fast healing for a few seconds. But doing so is very expensive Nanite-wise and rather difficult to do effectively, as you can never know when such healing would be useful. They are unlikely to stop someone from dying, even if you stack four of them. 400 healing per second can’t offset 1000 damage in 200-500 miliseconds. For giving someone an edge in a fight they are too expensive and unreliable. Revive grenade – revives up to 10 allies in 10 meters range with 50% of health. Can’t revive MAXes and the user. Costs 75 Nanites to resupply. The most used and the most useful of the three. They can revive many players at once without leaving medic defenseless, can be used to revive from distance, can be thrown a second or two before squad wipe etc. It’s wise to save them for when they are actually needed. Revive grenades can serve as a great source of certs in the biggest fights. They are invaluable during intense team play. C4 – universal manually detonated explosive sachel. Costs 75 Nanites to resupply. Med-kits – one time use item instantly regenerating whole health pool. Inter-class item, which costs 50 Nanites to resupply. Restoration kits – one time use item regenerating whole health over 6 seconds. Inter-class item, which costs 25 Nanites to resupply. You can learn more about them in these guides: C4 guide, med-/resto-kits guide. The more favored option for combat medics are med-kits. They allow you to come back faster to a fight, free you from necessity of using Nano-Regen Device or Regeneration implant, and in some cases can even make you survive otherwise fatal damage. Restoration kits are worse version of med-kits, you can read about this on their page linked above. C4 is very useful, but rarely. What I mean is – you have to expose yourself (get close) to use them (unless you are using them as traps), which isn’t a very good idea for medics. They do help greatly with eliminating enemy MAXes, killing a group of enemies around a corner, or finishing off enemy Sunderers. But the problem is that you won’t need them that often, so for most players med-kits may be a better choice. In this part I’m going to only mark which implants work best for combat medics. If you want to learn more about implants in general go to the Implant Guide. Regeneration – gives a slow, passive self-healing. It’s mandatory for medics which don’t use neither Nano-Regen device nor med-kits. Safeguard – provides damage resistance after you get revived. Useful when playing with a coordinated squad, when you can count on other medics to keep you up. Battle Hardened – reduces effect of bullet flinch and screen shake, allowing you to stay accurate under fire. Extremely useful for combat oriented medics. Catlike – an excellent implant for soloing; greatly increases your mobility when maxed out. Combat Surgeon – medic’s class-specific implant. Kills and revives will restore a portion of Nano-Regen Device’s energy, and at max rank will also provide a significant amount of bullet resistance for a few seconds. An extremely useful implant, especially when combined with Carapace. Carapace – an exceptionally rare implant, which replaces your shield bar with a second health bar. This will let you take advantage of all healing sources, such as NRD, to keep you constantly regenerating up to full HP even under fire. Phylactery – an exceptionally rare implant, which allows you to revive yourself under certain conditions. The most important duty of medics is keeping everyone alive. You should learn how to not die in the first place. Reviving sometimes requires exposing yourself, and if another medic dies trying to revive you, or if you are the only medic around – your team is going to slowly die off. Unless you manage to get back into position in time, which isn’t always possible. Another important role is combat support. Why support? Because by throwing yourself at the front you are decreasing your chance of survival. If you are playing alone, or in poorly managed public squad with no communication, you can do basically whatever you want to. But if you want to help, your best choice would be providing revives and healing to allies. Even a single revive grenade can change course of a battle, and if you are gradually pushing towards the point while reviving teammates on the way, you can have a big impact on a fight. It’s generally a good thing to apply “competitive” playstyle to casual play, but you have to remember that even if you are surrounded by allies, you can’t really rely on them. If you are getting tired with lack of organisation and loosing even fights join a coordinated squad. Public squads and platoons with communication and leadership can be a lot of fun, but they are very rarely on the level of an outfit working together and using voice comms extensively. In good public squads apply the same rules as in coordinated play, but it’s good to remember that nothing happens if you fail. Don’t push yourself and never, ever rely on random team mates. It’s also a nice gesture to use voice comms to encourage others to work harder. And always remember to thank your leader when you leave, leading strangers isn’t an easy task. If you want to learn more about how to play as a medic in a group, check below. Even if you don’t play in highly coordinated squads or in competitive play, most of it applies to usual combat too. By “coordinated squad” I mean a group of people in a squad or platoon, communicating a lot via voice comms (usually external, like TS3 or Mumble), working together and playing for a common goal. In these, medics are extremely important. You are often going to find yourself outnumbered and overpowered, with coordination and tactics as your only saving grace. That’s why you should be very careful of what you are doing. Don’t overextend, stick to cover, be wary of your surroundings. A team without medics won’t last for long. There will be cases where you will have to put yourself in danger though. Example: there is only 10 seconds left on capture timer, but defenders are storming in and it’s possible that they will manage to take the base back. In such scenario it would be the best to just jump into crowd and revive everyone like a madman. But that’s rather rare. Generally, you should be playing safe. Even if you are engaged in direct fight, do it carefully – use cover, retreat when you are losing, limit enemies’ angles. But don’t go too far into this and avoid combat entirely. No, medics are more than capable of fighting, and the smaller your team is, the more every person counts as a fighter. Also keep an eye on battle flow and decide when to engage or not. If there isn’t much enemy forces around your position, you can allow yourself to stay back in second line and focus on defense and support. But when things are starting getting serious – move forward and kill enemy. Never proceed to reviving/healing when enemy is overrunning your position, pull a weapon and fight them back! At most throw a revive grenade and activate your abilities. Whatever you do, do it smart. In coordinated squads communication is key. Make sure that your squad mates know where you are (tips for leaders: it’s a good idea to gather all medics in one fireteam), always call when you are throwing a revive grenade, if someone died a little far away from you let him know that you are going for him. Also when it’s relatively safe make use of your privilege of being able to stay in second line. Stop from time to time, look at the map, analyze the situation and report current situation to your team. What I think is the hardest to overcome for players just starting playing combat medic seriously is overcoming the desire to farm. You can help yourself by creating imaginary boundaries between objective, safe spots and dangerous positions. For example if your team is holding a building – don’t go outside, even when it’s beneficial – leave it to other classes. I want to avoid writing a huge wall of text detailing everything that you should know, I think that it would be a waste of both mine and your time. Instead, I’m going to highlight most important aspects of combat medic gameplay to make it easier for you to figure it out in action. It’s much easier to learn something through exercise, and I don’t want to enforce my views on you. Don’t overextend to help others unless you just want to grind certs or it is necessary to avoid team’s defeat. If you leave one teammate to die, but survive thanks to this – good job – now you can help many other allies (and dying isn’t really fun, isn’t it?). Ignore players who are pissed off because you skipped them. Oh, and if you hear someone screaming “Meeedic, meeeediiic” on in-game voice comms – don’t try to find them, it’s pointless. They can be pretty much anywhere around the base. Before you revive someone make sure that the killer is not a threat to you. Keep your gun up, check your surroundings, and then revive. If you see someone wounded and if stopping by doesn’t ruin your plans or make you die, then go and heal him. It’s very nice and you even get certs for that! Don’t run around with medical applicator, medkits or shield recharging field in hand, if someone attacks you are defenseless. Don’t waste your revive grenades to revive one guy. Save them for when they are really needed. Nano-Regen Device: Apart from healing yourself you can also use it to tank a bit more of damage, fasten healing of allies and passively heal nearby teammates while you are focusing on something else. Tanking damage – if you activate the ability before or a very short time after starting taking damage you will be able to take one more bullet before death, sometimes even two; it also helps quite a lot in surviving air to ground fire, f.e. rocket pods. Faster healing allies – you basically stack two healing factors and heal roughly 60% faster, it’s very useful when you don’t have much time. Passive healing – imagine that you are guarding a stair case. A wounded ally comes to you and ask for help, but if you pull out your medical applicator you are risking that enemies may advance while you are not looking, or even get a jump on both of you while you are not prpeared. So instead you keep aiming at the stairs and press F. You don’t even need to check if you healed him fully, just press F again when you stop receiving healing XP. Shield Recharging Field: This is a very interesting tactical tool. You can use it to direct the flow of allied troops – most people feel safer in the bubbles, and those who don’t will come to recharge faster – so if you want your allies to guard certain area instead of rushing at enemy spawn place a SRF there. It also doubles as a bait. Keeping the natural gravitation of players towards safety in mind – what enemy is going to do? Attack it expecting to get easy kills on oblivious foes, who think that they are safe there. But what happens instead – you take the bastards from safe position overlooking the field. Last, but not least – Shield Recharging Field can be used to tank damage too (also up to 1/2 bullets). Since you can replace the generator as many times as you want, don’t hesitate to use the device “aggresively” – place it whenever you stop for a longer while. Medical Applicator: Sometimes you can use it to lure enemies to charge you. If you find a dead ally in an exposed position and you think that there’s an enemy watching it – start reviving the ally, but don’t complete it, and then step out to catch the charging enemy off-guard. Many players will try to rush you to get an easy kill and if you time everything properly you will be the one with a big advantage. Just remember to be careful, not everyone is going to rush in, some players may wait outside for your ally to get back on feet. Revive/Healing grenades: When you are in a dire situation you can try to throw these non-lethal grenades at your enemies to scare them off. These grenades are not marked on your enemies’ screens with red grenade indicators, so it’s only going to work if they see you throwing them. Don’t overuse it to avoid wasting Nanites and exposing yourself – it’s almost always better to shoot / pull a secondary or run away instead. Medium Assault is a nickname for combat focused medics. Despite medic being a support class, it’s core activity is fighting, meaning that a good medic has to be skilled in combat. This is a short guide highlighting most important things that you need to learn in order to be a good ground trooper (not necessarily a medic). Be AWARE. Know your surroundings, keep an eye on mini-map, analyze battle flow and act accordingly. Master the gunplay. An average FPS player doesn’t need to train much to be good at shooting in PlanetSide 2. Click the Gunplay Guide to learn more. Fine-tune your decision-making. This comes mostly from experience. Use cover and move behind cover pieces. You can learn more in this video. Be conscious about what you are doing and analyze your mistakes. This will help you become a better player in general. Know your equipment and change it accordingly to situation. I highly recommend Renzor’s Being Proffessional Matters tutorials series if you want to learn more about improving as an infantryman in general. Combat Medic’s directive tree is one of the easiest and most enjoyable to complete. You can easily finish it just by simply playing the class in it’s designed role. Two out of six objectives can cause some problems, but there are always ways to ease the grind. And remember that you only need to complete five objectives. Decide which one is the most difficult for you and skip it entirely. Healing Ribbons – earned by healing your allies with any of your healing tools; one ribbon is earned after about 10.000 hit points healed, so as you can see – it’s rather easy to complete. If you remember to heal any wounded teammate you see (only when it’s safe of course), you should be able to finish this directive very quickly. Reviving Ribbons – they are earned by reviving teammates with either Medical Applicator or Revive Grenades. Another very easy to do directive, especially if you use Revive Grenades in combination with Grenade Bandolier. Each ribbon requires 15 revives. Shielding Ribbons – granted by restoring shields of allies with your Shield Recharging Field. It takes a rather small amount of shield points recharging to earn a ribbon and this makes this directive swift to complete as well. You of course need to unlock Shield Recharging Field in order to earn these ribbons. Kills – this one is straightforward. You have to kill certain amount of enemies to finish this directive. Remember that these kills have to be made with infantry weapons. Enemy Medic Kills – your objective is to kill a given number of enemy Combat Medics. 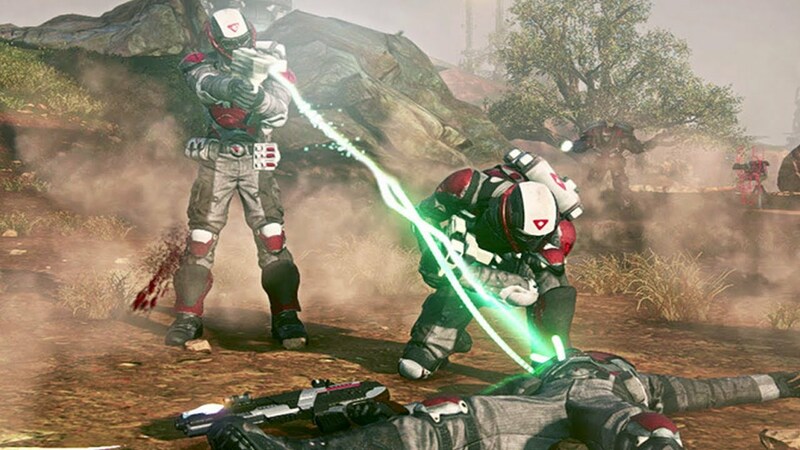 The problem lies in general low presence of medics on the fields of Auraxis, and in the way most medics play (and this is the right way) – behind their allies. So getting all these kills is going to get you some time. The only way to fastforward it is to flank more and attack enemy forces from beind. Savior Kills – in order to a kill being considered a savior kill, you have to eliminate an enemy while he is dealing health damage to your ally. There are several problems with it: 1) your ally can’t die, 2) most of the time it requires you to be in the middle of a fight, 3) you are basically stealing kills (not that this is a bad thing). If you want to complete the directive tree by doing this objective, prepare for a long grind, as savior kills are pretty difficult to get. Luckily, there are a few things which can help. First – MAX units don’t have any shields at all, so any enemy infantryman dealing damage to them will grant you a savior kill, it’s a good idea to stick to MAXes if you want to complete this fast. Second – it’s easier to earn savior kills from distance. If you place yourself a bit away from a group of allies fighting with a group of enemies and find an angle to safely shoot at your foes – you not only get more kills this way, but there’s also a higher chance of getting a savior kill if you are not being target. Allows use of Battle Rifles in the secondary weapon slot, excluding Auraxium weapons. Sidearms are still going to be better for situations when you need to just quickly finish off an enemy after running out of ammo for the primary weapon, or when you are caught reloading or using your Med Tool. Besides shortest Equip Time, sidearms also have fastest reloads, so they will also take less time to reload and go back to your primary weapon. That speed is what you would be losing when going for a Battle Rifle secondary. However, what you will be gaining is a versatile medium to long range weapon. You can combine Battle Rifle secondary with a CQC AR or a Carbine, and in this way have a versatile loadout that can effectively engage at any range. That said, most Carbines and ARs remain effective at close to medium range, which is where most of the “useful” fighting happens, and generally you don’t have much reason to engage enemies at longer ranges, which is likely to end up with you getting sniped anyway. Current Battle Rifles are fairly lackluster, and giving up the all-important sidearm seems hard to justify. Maybe once the new “marskman” rifles get released this recommendation will change. Unlocks access to Carbines on the Combat Medic, excluding Auraxium weapons. Carbines generally have shorter effective range, but they have shorter Equip Time, better Hip Fire, and they retain Hip Fire accuracy even while jumping or falling, increasing your combat mobility. This trait can be interesting when combined with Catlike 5 implant. TR medics might prefer Jaguar Carbine over TAR Assault Rifle, due to its longer effective range at the cost of slightly lower Rate of Fire. NC medics might prefer Bandit Carbine instead of Carnage AR for its higher damage per mag and higher Alpha Damage at the cost of a little bit of DPS. VS medics might prefer VX6-7 instead of H-V45 Assault Rifle for its faster reload at the cost of 75% ADS. All of these mentioned weapons also come with improved Hip Fire, especially when jumping and falling. All that said, outside of these mentioned weapons, or doing some Catlike 5 shenanigans, there doesn’t seem to be much reason for a Combat Medic to use a Carbine. Unlocks access to Concussion Grenades on the Combat Medic. This seems like a pointless perk for a Combat Medic. This grenade is mostly useful while flanking enemy crowds, which isn’t a typical gameplay situation for a Combat Medic. From most perspectives, Rez Grenade is infinitely more useful. Carapace Medics would prefer a Healing Grenade for actual combat. Conc Grenades can potentially be useful while soloing, especially if you don’t have Carapace, but it’s still one of the weakest perks out there. Please share worthy sources and videos. If you have any feedback, an interesting fact or want to share something, feel free to contact the administrator or me, or just leave a comment below. Supose you kill an enemy medic, does the kill count for ‘Kill’ and ‘Medic Kill’ on the directives? Yes, that counts as both. 2.2.1 What to buy to further upgrade the class?